Conservative dark money spends big to tell young voters in battleground states about pro-pot, anti-war “progressive” third-party candidates. The American Future Fund is an enthusiastically conservative organization that each election season fills the airwaves with ads hailing right-wing causes and socially conservative Republican candidates, while ripping Democratic officials and contenders. Confused? Don’t be. In close races, those third-party candidates might just pull a few votes away from Democratic contenders, who are specifically attacked in the ads. Yes, that’s playing the margins. But when money is no object, every strategy gets tried. Welcome to the brave new world of hyper-cynical, win-at-any-cost, big-money politics. Practically, what that means is that, according to the Annenberg Public Policy Center’s FactCheck.org project, “AFF spent just under $24.5 million on independent expenditures during the 2012 election cycle—nearly all of it (about $20.8 million) in support of Republican presidential nominee Mitt Romney and against President Obama.” According to the Center for Responsive Politics, the group “received more than 92 percent of its 2012 revenues from two organizations connected to Charles and David Koch.” This year, one of the primary Koch-backed groups says it is moving money elsewhere; but the American Future Fund remains flush with cash. Nor does it have to abide by the standards that most Americans associate with politics. It can pretty much write its own rules. And so it has. This fall, the American Future Fund and another group, American Future Fund Political Action (a “separate” organization that describes itself as “a federal political committee which primarily helps members elect candidates who reflect our values through a variety of activities aimed at influencing the outcome of the next election”) are busy, busy, busy—spending millions, millions, millions. American Future Fund Political Action’s involved in House and Senate races all over the country. The group’s attacks on Democrat Bruce Braley are among the roughest being aired in the very rough Iowa US Senate contest, and it’s just up with television ads condemning Senator Jeff Merkley, D-Oregon. But the American Future Fund is not always so negative. Though the American Future Fund does not list marijuana legalization, expansion of access to medical marijuana or drug-law reform as a part of its mission as “a voice for conservative principles that sustains free market ideals focused on bolstering America’s global competitiveness,” the group has produced and paid for expensive social media campaigns drawing attention to Libertarian candidates who do support legalization of marijuana. Haugh, a pizza deliveryman who so far has spent under $10,000 on his run, is the sudden beneficiary of $225,000 in spending to talk up his candidacy—and to tear into Kay Hagan. The Libertarian tells reporters on Twitter that he feels like “a character in a Camus novel” and frets about the “dark money” influence on the race. The American Freedom Fund won’t identify the source of the money that is paying for the ads. As noted above, the group benefited in 2012 from substantial funding from another group that is backed by billionaire conservative donors Charles and David Koch, Freedom Partners. A Freedom Partners spokesman told reporters that the organization is not currently funding the American Future Fund. Fair enough. It’s no secret that Koch brothers money flows in many directions at election time and, of course, the Koch brothers are not the only right-wing donors who this year have been spending heavily to help Republicans retake control of the Senate. Nor is there much dispute with regard to the American Future Fund intervention in the close Wisconsin gubernatorial race between Walker and Democrat Mary Burke. Robert Burke, a serious and sincere Libertarian, is not playing along. But, even if the ads are absurdly over the top and disrespectful of the broad and deep concerns of young voters, there is a method to the group’s madness. Moving even a small number of young voters away from Mary Burke and toward Robert Burke could be definitional in a close finish. Walker has throughout his tenure polled poorly among voters who are under the age of 30. There are a lot of reasons for this. But it is a fact that the governor is an extreme social conservative who talks about marijuana as a “gateway” drug and has made support for drug testing of food stamp recipients a major theme of his 2014 reelection campaign. 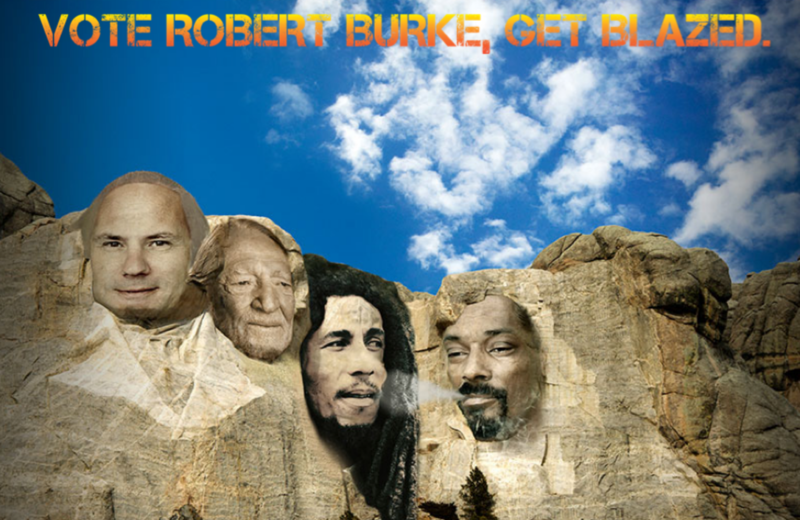 On the other hand, his Democratic challenger, Burke, supports legalization of medicinal marijuana and has a track record of social moderation that is more in sync with young voters. She’s also talking about ways to make college more affordable, to ease the burden of student-loan debt and to promote job growth for young people. To be fair, that’s just one explanation.